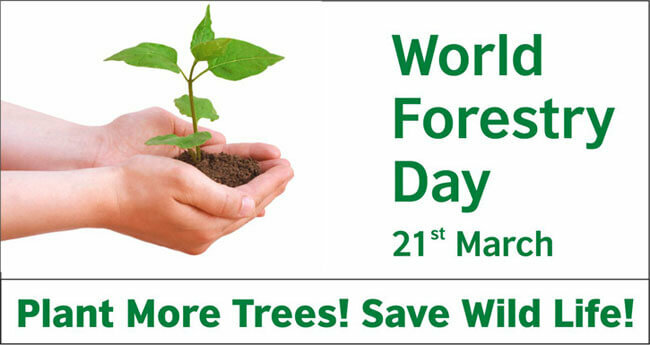 The World Forestry Day was established on the March 21, by resolution of the UN General Assembly on November 28, 2012. The Day celebrates and raises awareness of the importance of all types of forests. On each International Day of Forests, countries are encouraged to undertake local, national and international efforts to organize activities involving forests and trees, such as tree planting campaigns. The theme for each International Day of Forests is chosen by the Collaborative Partnership on Forests. The celebration also involves bringing awareness in people about the anatomy of forestry like protection, production, recreation and the major contribution to the living organisms. March 21st was chosen to be observed as World Forest Day for it is both the autumnal equinox in the Southern Hemisphere and the vernal equinox in the Northern Hemisphere. It is the duty of each and every individual to participate in deforestation and creation of new forests. The forests help to control our planet’s temperature, provide us with oxygen and absorb pollution. It is not only home for all living species but also the forest is one of the best and continuous sources of rich nutrients. Studying in deep will make us realize that the place we are living today was initially a forest area. Each year more than 13 million hectares (32 million acres) of forests are lost, an area roughly the size of England. Forests provide food, fiber, water and medicines for approximately 1.6 billion of the world’s poorest people, including indigenous peoples with unique cultures. A forest just doesn’t mean trees but it’s an entire complex, a living community. Many interdependent species of plants and animals dwell beneath the forest canopy; the forest soil is a home to large variety of invertebrates, bacteria and fungi which play an essential role in cycling nutrients in the soil and the forest. The reckless felling of trees is creating many problems in the surroundings so the need of the hour says that everybody should ponder seriously over this issue and stop activities that are against the welfare of forests. Everybody should actively involve themselves in prevention and creation of new forests. And situations of deforestation and over-gazing should be avoided. According to rules of Forest Department, 10 trees should be planted in exchange of cutting down one tree. Though, in last two decades only 1% trees have been planted. The survival of the rich generation of flora and fauna in the country is in danger due to exploitation of forests. Chopping down forests in hilly areas results in loosening of soil, thus the upper layer of fertile earth is eroding which is leading to uncontrolled rain and flood. And India is a country which is highly dependable on its agriculture, hence. it becomes even more important for us to protect our forests and prevent them from any ill practices.